First, thanks for your input, ideas and suggestions as a result of recent blogposts here. Just like the radio shows I used to present, I always appreciate constructive feedback. I'm doing this because I want a conversation. Either post below or get back to me directly. Together with colleagues in the Critical Distance guild, I'm currently using disruptive innovation to tackle a number of challenges for both clients and to make pivotal decisions for our own company. We're currently focussed on helping young companies progress at a very specific point in their development. In Lean Start-up jargon, it's that period after Demo Day when the founders are in search of strategic partners to take their dream to the next stage. The small companies don't have the cash to get there themselves. So selecting the right partners is often crucial to success. Remember that Geoffrey Moore's tech adoption bell curve is still valid. He wrote the book Crossing the Chasm in 1990. It was one of the first to explain why the market development problem was so difficult. 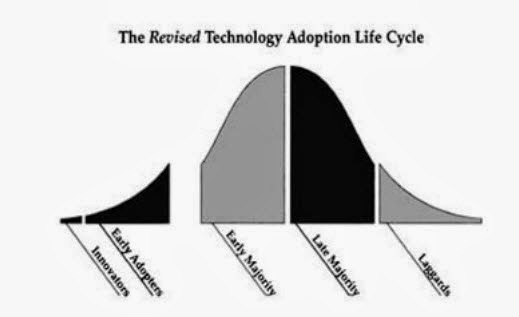 That gap between the early adopters and the early majority can be disastrous if you are not ready for it. That chasm that most companies have to cross to get accepted has not gone away. My experience is that it's nine months wide around here (Western Europe). For the last two years I have intensively worked with several young companies watching how they grow, learning as much from them as they for people. It's been a practical partnership. 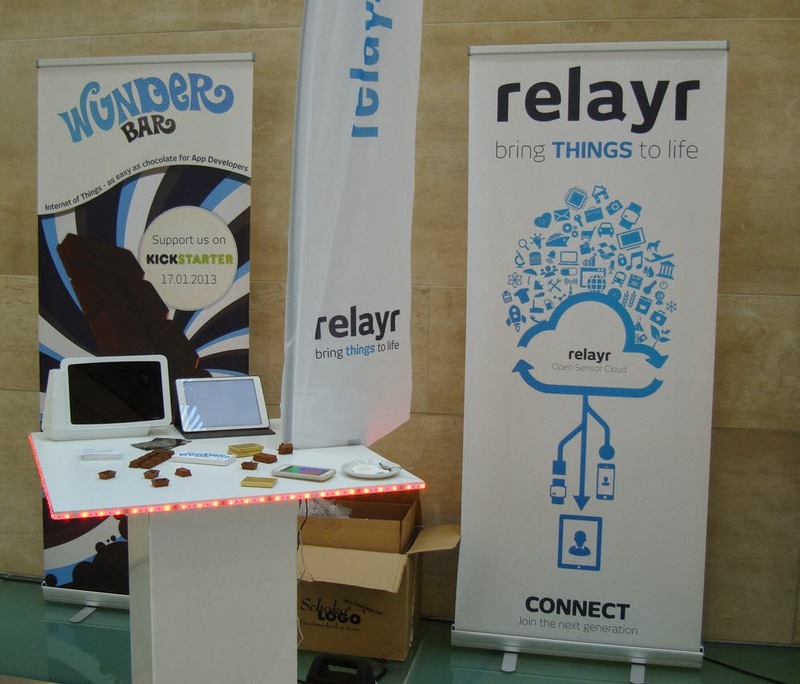 Several of these companies have taken the route of being part of an accelerator program. This is a 3 month organised program where, basically, teams gets access to a mentor network. If there's a good match, then they are able to speed up development, achieving in three months what would normally take a year. In this highly competitive world it can mean the difference between getting funded to progressing further or sinking into despair and ruin. There's a fine line between success and failure. I'm delighted that some accelerators are now being transparent with their results. I learned by attending countless pitchdays and new tech conferences that original ideas are few and far between. So what? The real geniuses are the ones that seize an idea - no matter where it came from-, understand and test its potential, then turn it into something that's perceived as "essential" in the lives of other people. It may entertain them. It may inform them. It could ultimately change those peoples' lives. Here is cash-strapped Western Europe, large corporations are obsessed with "innovation", without really defining which sort of innovation they mean. In practice, I conclude that the incumbents are usually searching for someone who can do more, cheaper. 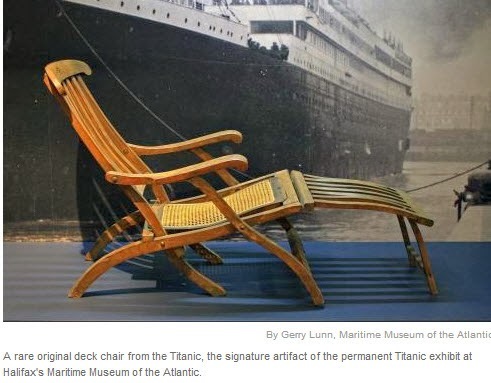 Profits may even return, for a while, but it's just re-arranging deck chairs on the Titanic. That's a shame because it creates false hope. And yet there is another path. I believe in the process that others have called disruptive innovation. It is certainly working for what we're doing in these cash-strapped times in Europe. Perhaps the reason why so many companies flounder is that they haven't defined which business they are disrupting. 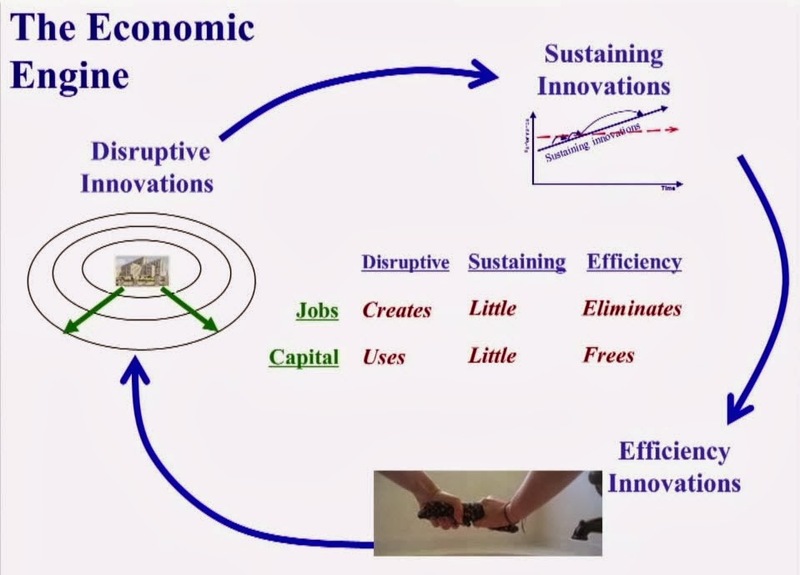 Or they may be busy with the other two types of innovation : sustained innovation ("Lets Make Things Better", e.g. the old Philips slogan) or efficiency innovation (devise a process that's produces the same result but a lot cheaper, e.g. what Walmart did for consumer retail or Amazon did for book distribution). As we've discussed previously on this blog, only disruptive innovation creates growth in society. The other innovation simply makes the most of ultimate decline. We're seeing disruption in publishing, broadcasting, healthcare, high-tech, local government; in fact please show me a sector where disruptive companies are not active and I'll believe you'll find an industry sector which is about to enter a new era. - history. Mechanical clock makers, International Radio Broadcasting, Floppy Disc manufacturers. Without disruptors there is no a chance to reinvent, change and adapt to a market. And, believe me, you don't want to invest a single second in managing decline!